Wait! 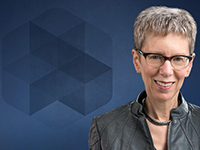 Before you buy your travel tickets for the NAFSA 2018 Annual Conference & Expo in Philadelphia, take note that Terry Gross, the award-winning Radio Hall of Fame member, National Humanities Medal recipient, and National Public Radio host of Fresh Air (the most downloaded podcast on the Apple platform for two years), will be speaking to NAFSAns – live! – on Friday, June 1, from 11:30 a.m. to 12:30 p.m. Since 1987, WHYY-FM, a public radio station based in Philadelphia, has produced a daily, one-hour national edition of Fresh Air. The program is broadcast on nearly 600 stations, and it became the first non-drivetime show in public radio history to reach more than 5 million listeners a week. Terry Gross is a compelling contributor to the important conversations happening every day on U.S. public radio, covering a wide range of topics that bring to light ideas that often do not get extensive mainstream coverage or that benefit from a different perspective. Many of her interviews are directly relevant to issues that international education aims to address, in particular, cultural understanding and world peace. In the last month, she’s interviewed (or replayed interviews with) people as diverse as Mexican-American author Luis Alberto Urrea, who wrote The House of Broken Angels, to Pakistani activist and human rights lawyer Asma Jahangir, who died in 2018, to The New Yorker writer Jonathan Blitzer who spoke about border issues and DACA. Terry Gross offers worldly insights on current events, as well as unique perspectives based on her numerous interviews with world leaders in a number of professional fields. Most impressive is that her preparation is exemplary in every case, and she is so well prepared that even if an interview veers off the planned course, she is able to steer it in a meaningful way. To learn more about Terry Gross and the numerous interviews she’s masterfully conducted over the years, check out her 2004 book All I Did Was Ask: Conversations with Writers, Actors, Musicians, and Artists. Trust me, you will want to book your flight out of Philadelphia for a time after 3:00 p.m. on Friday, June 1, so you can hear her in-person for what promises to be an exciting and informative plenary session as we close out NAFSA 2018. Bonnie Bissonette is director, education abroad and international safety, for the Center for Global Education Initiatives at the University of Maryland-Baltimore. She serves as Vice President for Public Policy and Practice on NAFSA’s Board of Directors.